Congratulations to Ryan Alford & Lillian Shortle for being named National Merit Finalists! 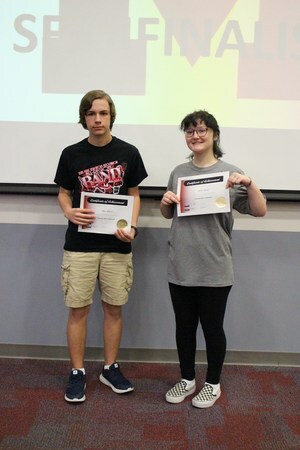 Magnolia High School seniors, Ryan Alford & Lillian Shortle, earned the prominent distinction of National Merit Finalist in the 63rd Annual National Merit Scholarship Program. Ryan & Lillian were named a semifinalist this past fall based on their Preliminary SAT scores, and advanced to the next level after meeting rigorous academic requirements and achieving outstanding SAT results. An estimated 1.6 million students from across the nation entered this academic competition by taking the PSAT. Approximately 16,000 of them earned recognition as Finalists this year. To be considered as a finalist, the students submitted detailed applications noting their academic achievements, participation in school and community activities, demonstrated leadership abilities, employment, and honors; an endorsement and recommendation from a high school official; and an essay. Students also must earn SAT scores that confirm their PSAT performance. Finalists will compete for 7,500 scholarships worth about $33 million, which will be awarded in the spring. Approximately half of all finalists will win a scholarship. In the National Merit® Scholarship Program, three types of Merit Scholarship® awards are offered to Finalists: National Merit $2500 Scholarships, corporate-sponsored Merit Scholarship awards, and college-sponsored Merit Scholarship awards. Special Scholarships are awarded to outstanding students who are not finalists and meet a corporate sponsor's criteria. MHS is proud of these two seniors who have demonstrated a high degree of academic excellence and extracurricular pursuits throughout their high school career. Congratulations and best of luck to them as they continue competing for these scholarships!